When selling your home, nothing can give you a headache quite like trying to market around undesirable features. Selling a home with a shared driveway can be hard, but it’s not impossible. Shared costs: The biggest advantage of a common area is splitting the cost of maintenance, snow removal and any damage repairs. Pristine appearance: In a residential area with many houses packed tightly together, reducing the number of driveways gives an attractive, clean look. Access issues: If parking spaces are scarce or if the neighbors often have guests, they may begin using the driveway for parking. This blocks you from going in and out and could create problems if it occurs frequently. Neighbor disputes: If one or more neighbors refuse to pay for their share of repair costs, sharing the driveway can easily turn into a nightmare. What Is a Driveway Easement? These cons can be avoided if all parties follow a clear set of rules outlining the driveway’s use. 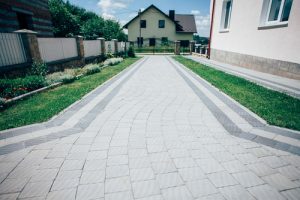 Shared driveways usually have an easement, a written agreement giving someone the right to go onto someone else’s property within certain boundaries. Typically, each homeowner owns part of the driveway but can legally use it entirely to access garages or parking spaces. The agreement will likely also cover how it should be cared for and how disagreements should be handled. If sharing a driveway, it’s essential to secure a written agreement that’s clearly understood by all neighbors. Talk to a real estate attorney and make sure the easement and your property title are readily available so you can discuss your ownership rights with potential buyers. Above all, buyers are looking for people they can trust. Don’t try to brush over any negatives of your driveway. Instead, have your real estate agent sit down with buyers and discuss the easement boundaries and use of the driveway as outlined in the easement. Work with your agent to develop a marketing plan that accentuates the positives of a shared driveway. Prepare responses to common questions before you begin showing your home. Make sure your house is immaculately clean and properly staged. Having a beautiful home doesn’t negate the drawbacks of a shared driveway, but enhancing its attractiveness will make buyers more likely to overlook the driveway’s cons. If you’re trying to sell a house with a shared driveway, you need an agent who knows how to market well. If you live in the York area, contact CENTURY 21 Core Partners to find the right agent for you.